SAO PAULO (AP) — The top leftist candidate for Brazil’s presidency on Wednesday accused front-runner Jairo Bolsonaro of spreading falsehoods about him and his family on social media, as new polls showed the far-right candidate’s lead widening with days before the vote. 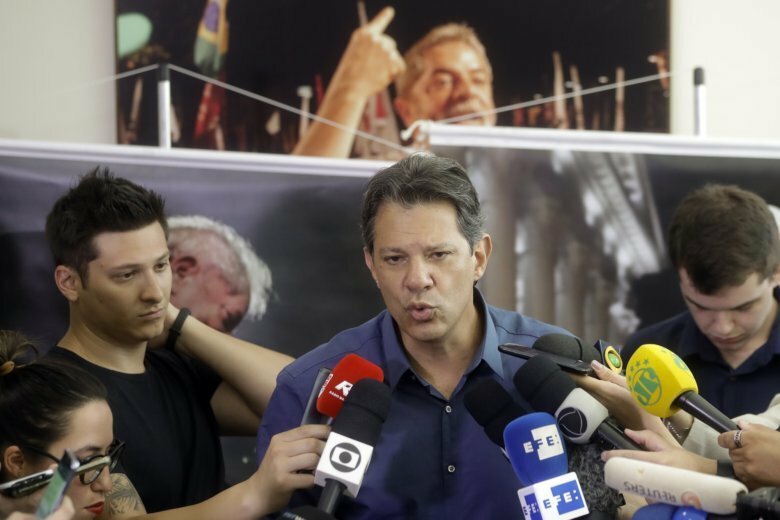 The accusations marked a shift in strategy for Workers’ Party candidate Fernando Haddad, who had earlier avoided direct attacks on Bolsonaro. Haddad accused Bolsonaro of sending false WhatsApp messages, including one that the leftist was plotting to let authorities choose the gender of 5-year-olds. Another showed a manipulated picture of his running mate Manuela D’Avila wearing a shirt that read “Jesus is a transvestite.” A third featured the candidate supposedly saying election day had been switched from Sunday Oct. 7 to Monday. Haddad had been steadily rising in the polls due to the endorsement of jailed former President Luiz Inacio Lula da Silva, who has been barred by the courts from running. But three new polls this week showed his momentum stalled with Bolsonaro building on his lead in Sunday’s first round of voting. Haddad had largely avoided direct attacks on Bolsonaro until now, apparently because Workers’ Party strategists thought the far-right congressman would alienate so many voters that he would be easy prey in the second-round runoff. Bolsonaro is noted for comments about gays, women and minorities considered offensive, as well as expressing nostalgia for Brazil’s past military dictatorship. But a survey by polling company Datafolha published on Tuesday showed Haddad’s lead in the second round disappearing, with the rightist up 44 percent to 42 percent, within the poll’s 2 percentage point margin of error. The poll’s result surprised many analysts because it came after Bolsonaro had an apparently bad week. A protest led by women against him on Saturday had a large turnout, friendly fire from his running mate gave ammunition to his rivals and one of his ex-wives accused him of hiding assets from tax and electoral authorities, and of threatening her life. The Worker’s Party opened a WhatsApp channel to counter the social media smears and said it had received more than 5,000 reports of falsehoods being spread on messaging apps within the first 12 hours.